Dr. Sotka's lab works on a variety of questions! On these pages we will focus on Dr. Sotka's work with Gracilaria vermiculophylla, an invasive seaweed over the years. 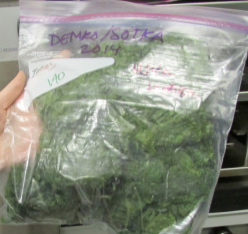 The scientists at Dr. Sotka's lab run experiments on this seaweed to learn more about it. Where did this seaweed come from? What type of organisms like to eat it? Can Gracilaria survive in extreme cold or hot temperatures? How much salt in the water can Gracilaria tolerate? These are all questions that the scientists have been working to answer! Dr. Sotka is an Associate Professor at the College of Charleston. 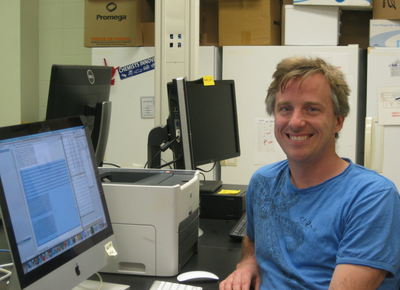 His major research interests include marine ecology, conservation biology, and molecular ecology, to name a few. When he isn't in the lab you might catch him in the classroom or traipsing through the marsh. Want to more? 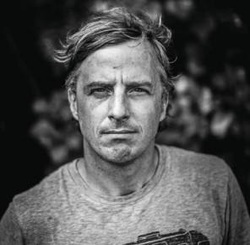 Check out his official CofC blog here. Lauren is majoring in biology with a minor in environmental studies. 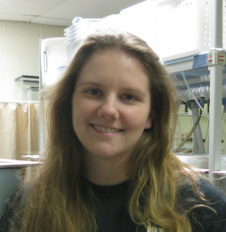 She helps Dr. Erik and Gracilaria research and has started researching how salinity can impact Gracilaria. In middle school? "Ask as many questions as you can! Work hard in school and try to find out more about things that you think are interesting." In high school? "Work hard and don't shy away from hard classes or more challenging opportunities. You'll get to have a better understanding of the world and more hands-on experience which makes science way more fun. Plus, you'll have more chances to figure out what subjects really interest you." Ben Flanagan is a graduate student from Fort Mill, SC. He is looking into what role duration of exposure to thermal stress plays in Gracilaria's survival. His research will include exposing plants to one temperature for different amounts of time to see how Gracilaria will respond. In the future, he would like to do molecular work on heat shock proteins. A heat shock protein is a protein that is turned on or triggered by heat or other stresses that protects cells and organelles. Favorite Music: Country, Classic Rock, Hip-Hop, Reggae, anything that sounds good! In middle school? "Ask questions and be inquisitive. If something strikes your interest, ask your teachers about it. Try and learn as much as you can!" In high school? "Be energetic and passionate about the classes you take. Try and soak up as much of that valuable knowledge as possible!" 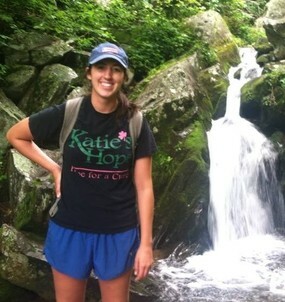 ​Katie's research is focused on an invasive species of amphipod, Ampithoe valida. Specifically, she is using genetic tools to figure out where it came from, how it got to where it is now, and the ecological impact it is having on native marine ecosystems. Hobbies: She enjoys swimming, going to concerts, and scenic road trips with good friends! ​What advice would you give some who wants to be a scientist? "Always be curious and never be afraid to ask questions!" 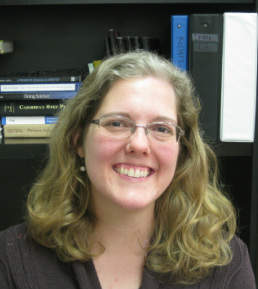 Stacy was a post-doctoral researcher in the Sotka lab. She is a marine ecologist and uses both field and molecular techniques to study populations of marine organisms. 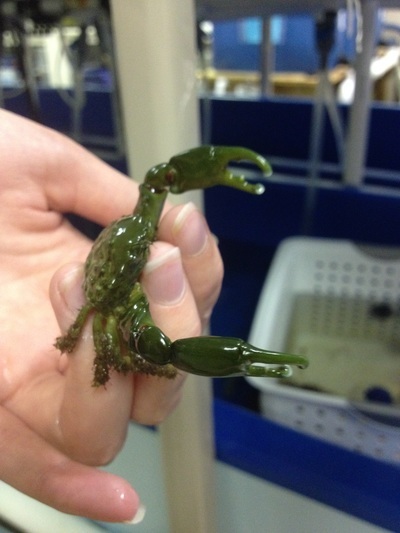 Though she has dabbled in invertebrates, she prefers working with algae, both big and small. Along with Drs. Sotka, Courtney Murren and Allan Strand, she co-authored a successful National Science Foundation grant, which allowed her to work in the Sotka Lab. ​Check out her website here! In middle school: "Work hard and get involved in science outreach programs through your school or local community"
In high school: "Don't be afraid to try to volunteer at your local zoo or aquarium or even a university biological laboratory. Enthusiastic volunteers are always wanted!" Dr. Stacy spent her time in the Sotka Lab investigating the invasive history of the red seaweed Gracilaria vermiculophylla (using genotypes and phenotypes). Dr. Stacy used molecular techniques and looked at the genetics of this seaweed in order to find out where this invasive seaweed came from. Gracilaria is native to the northwest Pacific (Japan, Russia, Korean Peninsula, and China). Red seaweeds do not travel far on their own, so something must have brought this seaweed to North America and Europe. The molecular tools, Dr. Stacy could analyze where this seaweed came from originally. Dr. Stacy uses a technique called PCR (polmarase chain reactions). PCR is used to help tell the difference between individuals of the same species using only their DNA. 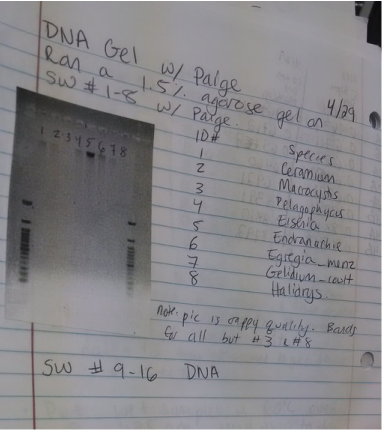 Stacy uses this method to identify the difference between male and female Gracilaria plants. 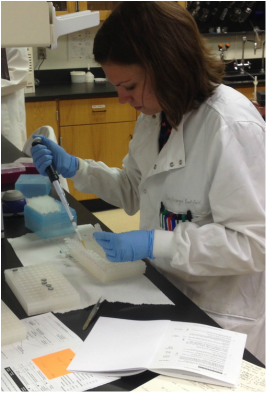 Here she is injecting seaweed DNA into test tubes with a tool called a pipette! 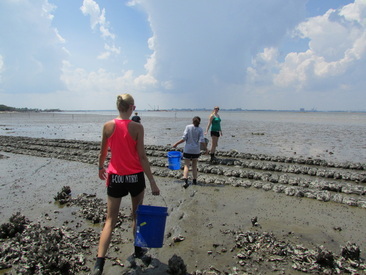 Besides using fancy techniques to study this seaweed, Dr. Stacy also did old fashioned field work. 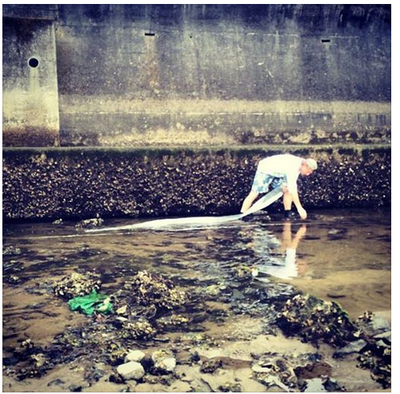 Once a month, she collected Gracilaria samples from different mudflats across the country. 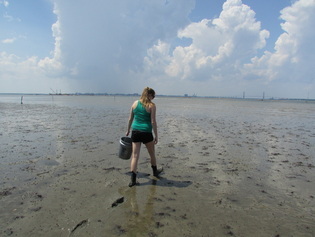 Her goal was to determine is the seaweed she collected was attached to the mudflat or drifting. She also recorded which stage of its life cycle (reproductive, vegetative stages) each seaweed sample was in. Below is the life cycle of Gracilaria. 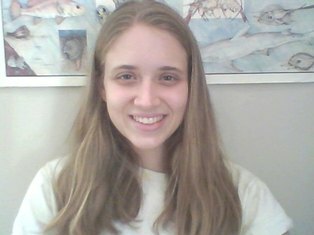 Paige worked in the Sotka Lab her junior year of undergraduate at the College of Charleston. She helped Dr. Sotka and Stacy research the invasive history of Gracilaria vermiculophylla. She performed experiments to test the response of Gracilaria from different areas of the world to salinity changes and herbivory. Middle school: "Work hard and ask lots of questions! Look around the world and see what interests you, then find out more about it!" High school: "Learn more about what interests you and volunteer somewhere where you can get hands-on experience, because that's where you learn the most! But most importantly do what makes you happy because people like others who want to learn." Sarah is a College of Charleston student from Atlanta, GA helping Dr. Stacy Kreuger-Hadfield and Dr. Sotka research the invasive history of Gracilaria vermiculophylla. 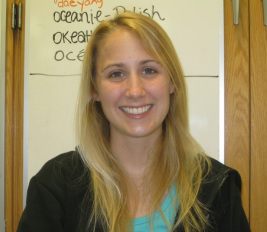 She used a molecular marker to differentiate between "native" and "non-native" populations of the seaweed. (Kids, "break it down" below!) This helps us to learn more about where the seaweed came from and how it spread, so that we can better manage this invasive species and others. In the fall (2015), she worked on this project and began work on Gracilaria's relationship with a native worm species, Diopatra cuprea. Her research involved exposing Gracilaria to a range of temperatures to see if how it will survive in these different thermal conditionals. Hobbies: Running, hiking, reading, and playing tennis. We asked Sarah how working in the Sotka Lab has been beneficial to her as a student. She said, "I think it is helpful figuring out what I like and don't like... there are fun parts and not so fun parts, you know." Sarah is using DNA to help her to figure out the difference between "native" and "non-native" populations of an invasive seaweed. In this instance "native" algae (seaweed) refers to the algae that is from Asia (China, Japan, and Korea), where these populations originated. "Non-native" refers to those populations that have invaded, and are now present in North America and Europe. In a nutshell: DNA is much like a finger print- it can help scientists tell the difference between living things when there is no other easy way to tell them apart. Sarah is using DNA to tell her where the seaweed in question is from. Nicole finished up her graduate research at the Sotka Lab. She spent most of her graduate research on the invasive species history of algae Gracilaria vermiculophylla. She laid the groundwork for current research on this seaweed's invasive history. Nicole looked at genetic traits of Gracilaria. She plans to develop a method for the best way to extract DNA from algae. Nicole had also looked at the relationship between Gracilaria, a non-native species and decorator polychaetes (worms), a native species to our marsh to see how these two organisms affect each other. 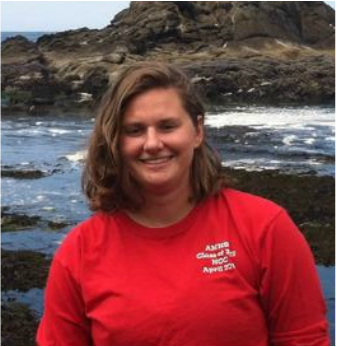 Nicole's research has shown that the invasive seaweed and worms have a relationship called conditional mutualism, meaning that sometimes one organism benefits more from their relationship. Check out her research website here! Relationships between biotic components of a given ecosystem can take many forms. When we are speaking of more long-term, close interactions between different species, the relationship can be described as symbiotic. So close in fact, many formal definitions of symbiosis include the phrase "living together". There are several ways to categorize symbiosis. The relationship can be beneficial to both organisms involved (mutualism), good for one and bad for the other (parasitism), or good for one with nothing either beneficial or harmful to the other (commensalism). 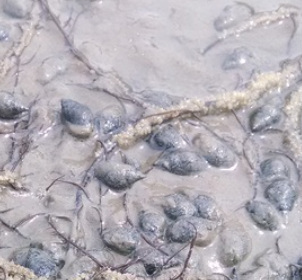 The Sotka lab is interested in how the invasive algae, Gracilaria vermiculophylla, interacts with biotic components of the mud flats it is found on. One of those interactions is with the plumed worm, Diopatra cuprea. 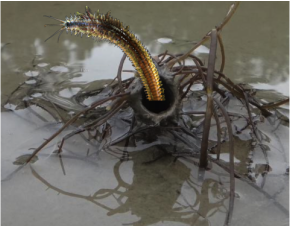 The plumed worm is a common sight on Southeastern shorelines. This omnivorous worm glues sediment and plant material together to build a hooded tube that protrudes from its soft surroundings. Check out a neat video of it building its home here. As Gracilaria has invaded our coast, Diopatra has made use of it by adding it to its tubes, in return anchoring the plant to the mud flat. Can you hypothesize what kind of interaction is between the algae and the worm? Nicole's research showed that Diopatra decorating its tubes with Gracilaria can be beneficial to the algae. 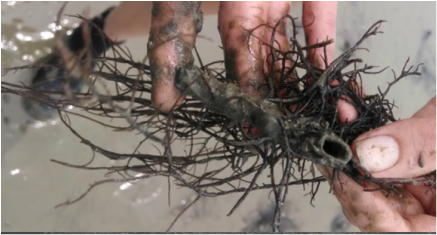 This is because Gracilaria vermiculophylla can anchor to the mudflut at a tidal height favorable for growth. In return, Gracilaria indirectly provides Diopatra with a food source. Results from lab experiments suggested that Diopatra benefits more from consuming the invertebrates that live on Gracilaria than from consuming Gracilaria directly. Nicole also found that given the right conditions in the field, the growth of Diopatra is correlated with the density (how much stuff is in a given space) of Gracilaria. There was also a positive relationship between the density of Gracilaria and the invertebrates present on the seaweed. Courtney conducted research to figure out the diversity within one population of invasive species. She looked to see how the invasive seaweed, Gracilaria vermiculophylla affects local organisms, such as amphipods and worms. Her research looked at the relationship of predator and prey in the marsh. Courtney was awarded the Knauss Fellowship through NOAA, which allowed her to work in Washington, D.C. on Capital Hill giving scientific advice to our politicians! Hobbies: Courtney loves sports, soccer, running and hiking! In elementary school? "Go outside, start looking at things, and ask questions!" In high school? "Pay attention in science classes... Just stay interested in what's going on around you." Her field survey and experiments demonstrated that polycultures of an invasive red seaweed Gracilaria vermiculophylla can have higher growth rates than monocultures do. Genetic diversity benefits ecosystem functioning and services within most species, but in this invasive, genetic diversity may facilitates invasion success. Meredith graduated from the Masters program at the College of Charleston. Her Masters research explored the basic biology of a large estuarine fish, the long nose gar, within South Carolina by determining its age, growth, and reproductive patterns as well as determining its dietary habits. In addition, she studied mercury, a common contaminant in fishes, within long nose gar to get a better idea of how fish and other top predators take up, or bioaccumulate, this metal within estuaries. In elementary school? "Go play outside and ask lots of questions!" In high school? "Work hard and try to get experience in science outside of school. Keep being curious!". 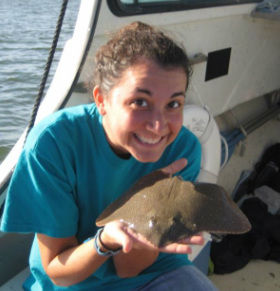 ​In the Sotka Lab, Meredith analyzed long-term fish capture data from the Charleston Harbor to detect changes in the make-up of fish communities over decades. 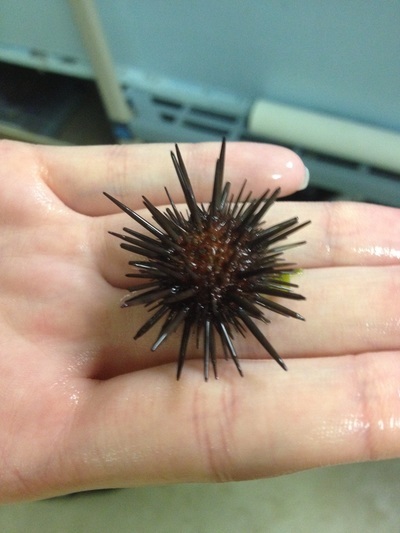 She also assists with various research projects in the lab including an investigation of whether the chemical properties of the invasive seaweed, Gracilaria vermiculophylla, make the seaweed foul-tasting to herbivores. 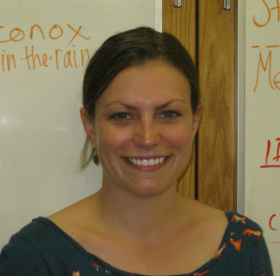 Meredith helps the graduate students with their research projects in the field and laboratory. The tube of a Diopatra cuprea made with Gracilaria. Meredith ran a feeding assay with the decorator worm, Diopatra cuprea, to see how they respond to the chemistry of Gracilaria. Diopatra live in tubes that they build and "decorate" with what is in their environments. 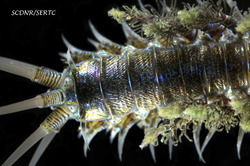 Usually bits of shell, Gracilaria, and Ulva are found attached to Diopatra tubes. Many seaweeds will produce chemicals that make them taste bad to herbivores and act as a defense. The worms love to eat Ulva, but they do not seem to like eating Gracilaria and we want to know why. To determine if Gracilaria has chemicals that keep Diopatra from wanting to eat it, we first extracted the chemicals from Gracilaria using Ethyl Acetate. 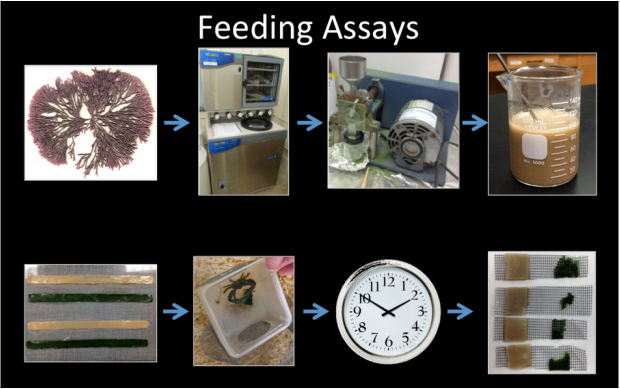 Then, we set up a feeding assay to compare how much Ulva the worms will eat when it is coated with just Ethyl Acetate and how much Ulva the worms will eat when it is coated with Ethyl Acetate and Gracilaria chemicals. This method allows us to find out if the chemicals of Gracilaria deter feeding by Diopatra. Since it is known that the worms like to eat Ulva, if they eat less of the Ulva when it has chemicals from Gracilaria, this will indicate that the chemistry produced by Gracilaria is protecting it from herbivores such as Diopatra. After breaking down the feeding assay with Diopatra, Ulva, and the chemical extracts of Gracilaria, no differences were found in the amount of Ulva the worms ate with Gracilaria chemicals painted on it and without Gracilaria chemicals. This tells us that the Gracilaria chemicals may not be preventing the worms from eating it. These results do not explain why the worms do not like to eat Gracilaria, so there are still questions to be answered! 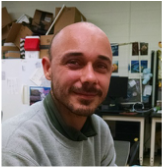 Connon was an undergraduate student who worked at Dr. Sotka's lab during Summer 2014. He was student at the State University of New York College of Environmental Science and Forestry (SUNY-ESF) in Syracuse, NY, where he studies conservation biology. His main interests are invertebrates (bugs, worms, etc.) and fungi, and he loves collecting and searching for mushrooms and insects in the woods. 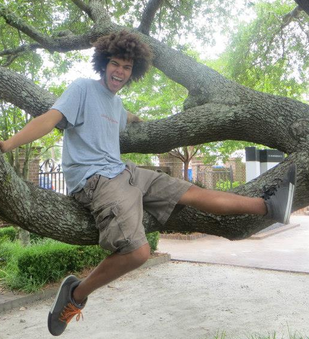 Connon was accepted into the Research Experiences for Undergraduates program (REU) at Grice summer 2014 , where he studied the growth of different populations of the non-native seaweed Gracilaria vermiculophylla at different salinities. He wanted to see if populations in the US have adapted to local salinities in order to see how the environment is affecting its spread and how the seaweed deals with it. At the school that he came from, almost all the research that goes on is based on land, and the REU program this summer allowed Connon to get more experience with ocean creatures. It also allowed him to see what is like to work in a lab, especially one with a lot going on in it! In elementary school: "Go outside every day and look for something new and cool, it could be anything! Ask big questions, ask little questions, and then look for answers--ask someone you know or look it up." In high school: "Same advice as elementary school. It never changes! Stay curious and you will make a wonderful scientist!" Hannah was a senior at Academic Magnet High School. She grew up in Mt Pleasant, SC and spends a lot of her time at the beach or on her boat. In the summer of 2014, she had the opportunity to do research at the Sotka lab through the HHMI (Howard Hughes Medical Institute) Grant and as part of her senior thesis for school! Hannah studied the invasive seaweed Gracilaria vermiculophylla to see how certain traits (like the amount of protein, the surface area to volume ratio, the branching frequency, and the amount of organic matter) are different in gametophytes (the haploid males and females) and sporophytes (the diploid individuals). Alyssa's graduate research looked at feeding patterns of marine herbivores and if they preferred to eat different types of seaweed. She looked at over 30 different types of seaweed found in different regions (polar, temperate, tropical) and compared how animals (local amphipods and crabs and urchins from the Florida Keys) eat the foreign seaweeds versus the local seaweed found here in our marsh. Alyssa also looked at the chemistry and DNA of these different types of seaweeds to make observations and comparisons. The goal is to have an idea as to which kinds of seaweeds are more appealing to eat and why. Favorite Music: The Beatles, Classic Rock, and a lot of 90's music! In elementary school? "Work hard in school!" In high school? "Also work hard in school. Get involved and get hands on experience outside of school." 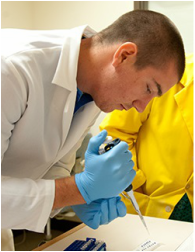 "Science is challenging and competitive"
Aaron is a student at The University of Akron studying biology. He is from New Philadelphia, OH. Aaron was drawn to CofC’s REU program because of the location (he loves Charleston), and because of Dr. Sotka’s focus on invasive species. 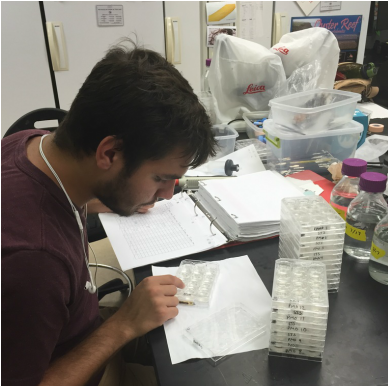 Aaron worked in the Sotka lab during the summer of 2015. 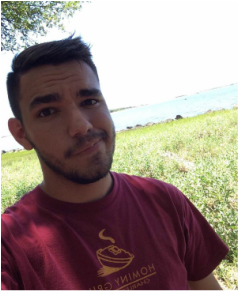 Aaron enjoys hiking in the woods and visiting cities (he loves learning the history and culture of a city like New York, Philadelphia, or Charleston). His favorite animal is the manatee; however, since he is a plant person, his favorite plant is Mimosa pudica (the sensitive plant). "Question everything! One of my mottos for life is that of the Royal Society of London: Nullius in verba (Take nobody’s word for it)." Aaron used Pulse Amplitude Modulation (PAM) fluorometry to measure the difference in photosynthetic efficiency between the native and non-native populations of Gracilaria. These same populations were tested under Aaron and Lauren’s salinity assay and Sarah’s temperature assay. 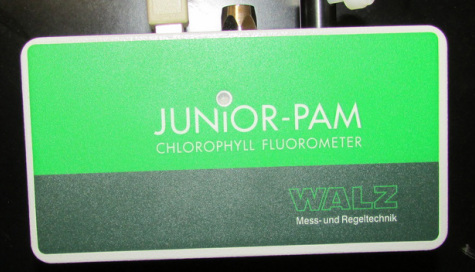 PAM fluorometry is able to quantify a plant’s ability to produce and store energy using the amount of light absorbed and reflected by the plant. A low absorbance indicates that a plant is stressed while a high absorbance indicates that a plant is healthy. Seeing differences between native and non-native populations will allow us to understand this marine invasion. 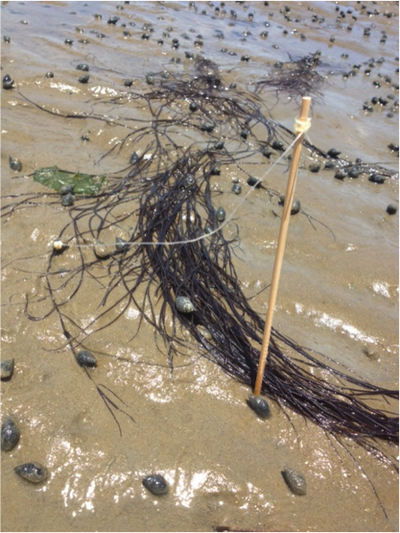 Aaron ran an experiment to see how exposing Gracilaria to different salinities affected the seaweed's health. When Gracilaria is unhealthy or dying it will become bleached (or lose its color). Aaron hypothesized that Gracilaria would experience higher rates of bleaching in fresh water because this is not its normal environmental conditions. Aaron tested 20 Gracilaria plants all from different locations and exposed them to 5 different salinities (fresh water 0 , 5, 10, 20, and seawater 30 ppt) over 8 days. He made daily observations, checking to see if the samples became bleached. After 8 days, bleaching occurred in fresh water (0 ppt) and some bleaching occurred in sampled exposed to 5ppt. The samples appeared healthy exposed to the other salinity values. Because of this, Aaron used PAM to measure how much the samples are photosynthesizing which indicated how healthy the plants are after going through this experiment. The amount each sample can photosynthesize may change depending on the salinity conditions. Aaron examining samples and rating their health. Graphs can help us understand information just by looking at a picture! Notice the peak on this graph. 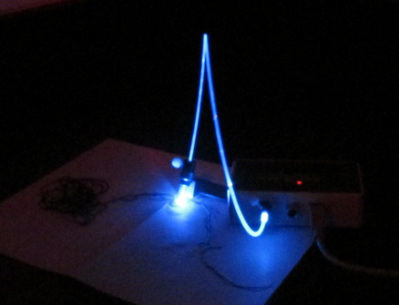 This shows the plant's activity after the fiber optic cord shown its bright light on it. Chlorophyll fluorescence has increased after the plant was flashed with the light. A lyophilizer is an instrument used for freeze-drying. Freeze-drying, also called lyophilization, is the process of dehydrating a material in order to preserve it. Samples are placed in the lyophilizer in a plastic bag. 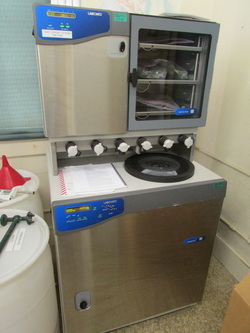 The samples are frozen and then the pressure is reduced in the lyophilizer to allow the frozen water in the samples to change directly from a solid to a gas. The process of a substance transitioning directly from solid to a gas is called sublimation. Freeze-dried Ulva lactuca samples, a green leafy seaweed found in our marshes. 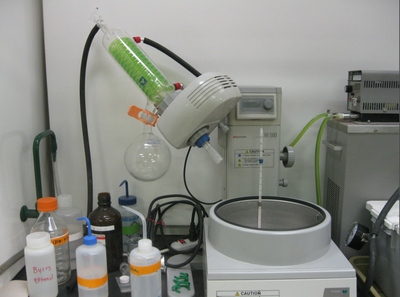 At the Sotka Lab, scientists use the lyophilizer to preserve seaweed samples used for their research. 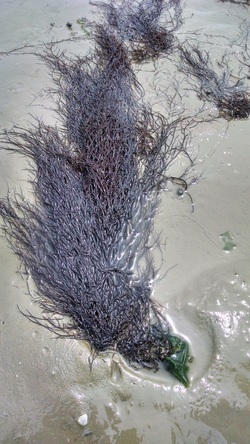 Seaweeds, such as Ulva lactuca, are collected in the mudflats outside the Sotka Lab. This particular kind of algae is used for feeding assays. Scientists out in the field collecting seaweed samples. When we think of summer time, we often think of daily outings to the beach or out on the marsh kayaking or boating, right? The sun is shining and the water is nice and warm. It's the perfect condition to be out and about. Scientists at the Sotka Lab also go outside in the marsh and mudflats daily. However, they are on a mission: to collect as much Ulva lactuca that they possibly can. During the summer, this seaweed disappears. It may be due to temperature change or just that there are more plant-eating herbivores. An abundant amount of animals in our marsh love to eat this seaweed. Because scientists need seaweed to run their research experiments all year, they must collect as much seaweed as possible before it is all eaten up! ​A pipette is a laboratory tool used to dispense a measured volume of liquid. 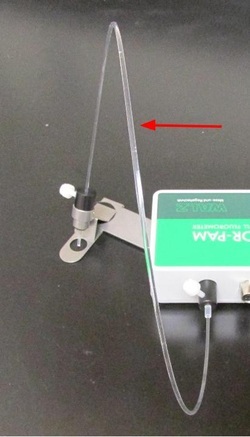 There are several designs of pipettes found in the Sotka Lab, each used for different purposes. 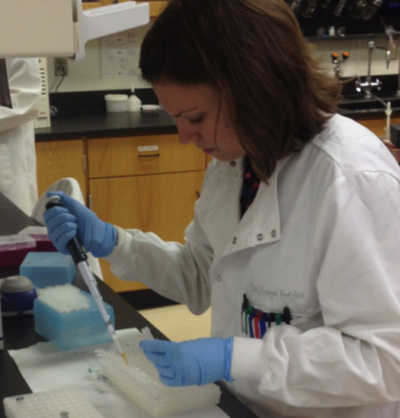 Dr. Stacy Krueger-Hadfield uses pipettes regularly for her work seaweed DNA! A multichannel pipette allows you to dispense multiple samples of the same volume at one time. Multichannel come in a variety of sizes. 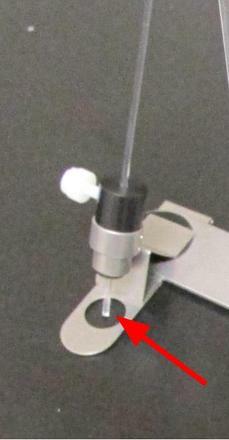 The lab has a P10 (measuring 1 to 10 microliters) with eight wells. DISTRIMAN repetitive pipette has three syringes that can cover volumes ranging from 1 microliter to 1.25 mL. 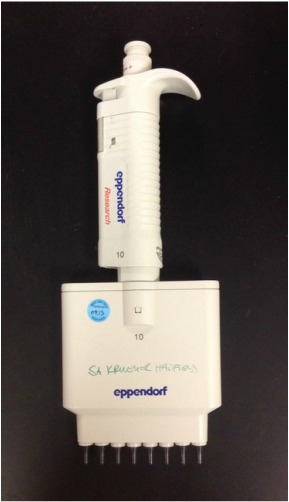 This pipette helps save time allowing up to 125 aliquots (portions) of the smallest volume to be dispensed. An electric pipette will measure volumes of 50 to 1250 microliters … much more than a multichannel and it also saves your thumb! Scientists at the Sotka Lab frequently use this Wiley Mill electric grinder for sample preparation. This machine does just what is its name says... it grinds up seaweed into powder! 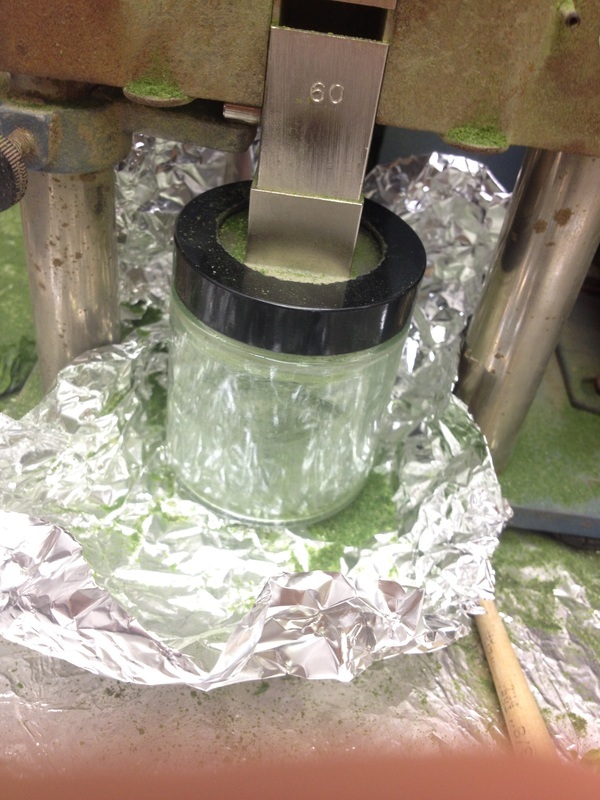 Freeze dried seaweed samples are poured little by little into the top silver opening. Seaweed is ground up with this moving blade. Powder seaweed is dispensed into a container at the bottom of the grinder. Why do scientists grind up seaweed samples? The Wiley Mill is essential for sample preparation. 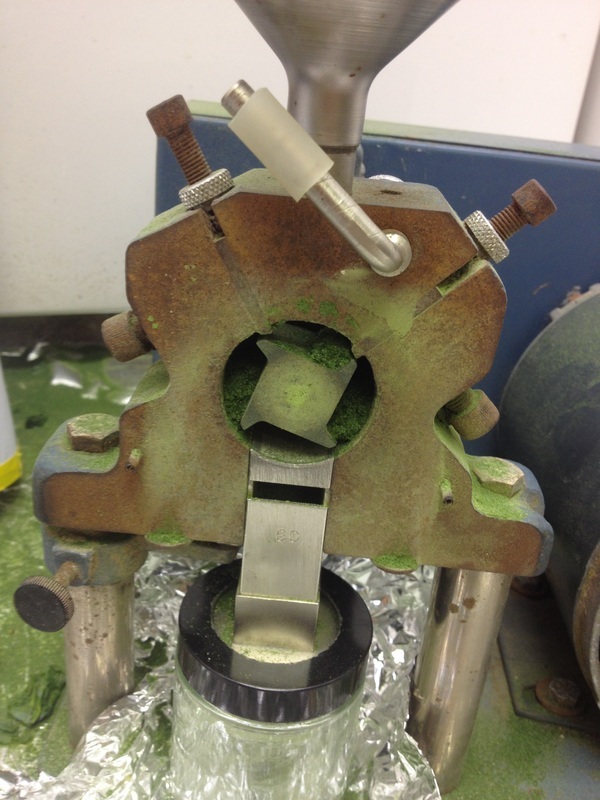 Scientists must grind up their seaweed samples to make it easier to run experiments. 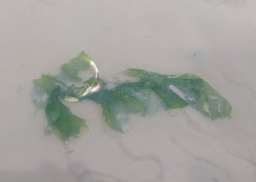 Once seaweed is in a powdered form, it can be combined with agar, a gelatinous substance and water to create a mixture used for feeding assays. A centrifuge is a piece of equipment that puts an object in rotation around a fixed axis. This machine uses centrifugal force to separate suspended particles. 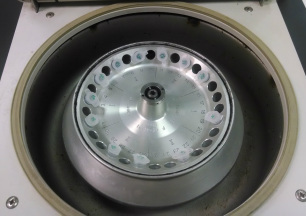 A centrifuge rotates at a very high speed in order to separate liquids from solids. Solids are more dense and will separate to the bottom of the tube. The rotating unit, called the rotor, has fixed holes drilled at an angle. Test tubes are placed in these slots and the motor is spun. As the centrifugal force is in the horizontal plane and the tubes are fixed at an angle, the particles have to travel only a little distance before they hit the wall and drop down to the bottom. We know from Newton's first law that a body will retain its velocity unless another force acts upon it. So when a body travels in a circle, a force must be applied to stop it from traveling in a straight line. The Sotka Lab analyzes microsatellite loci using fragment analysis and our single genes using Sanger sequencing on a capillary sequencer. 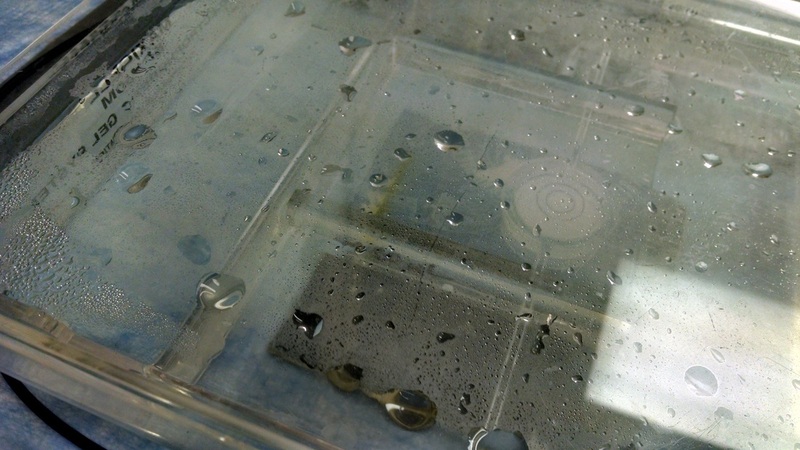 A capillary sequencer is not unlike agarose gels. 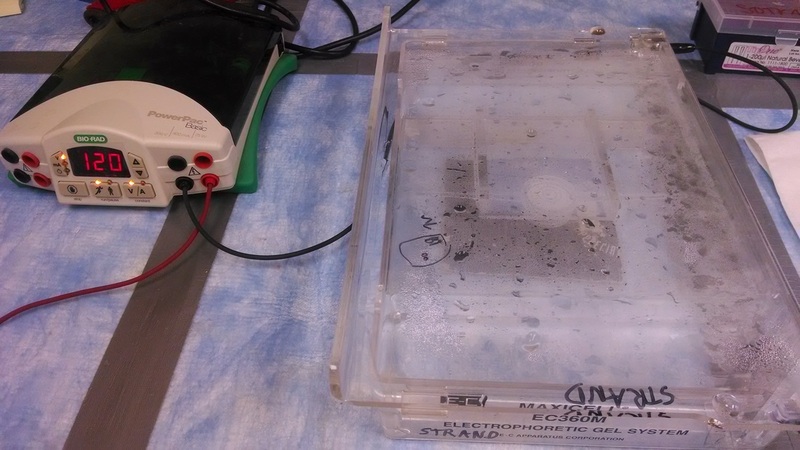 In both cases, we are using electrophoresis. In an agarose gel, DNA is placed at one end and then an electric current is applied causing the DNA molecules to move through the gel. In a capillary sequencer, the PCR product is labeled with a fluorescent dye, is run through an array of capillaries (the exact number depends on the type of machine) and is passed by a laser where the fluorescent dye lights up. In each well including our sample, we have also added a size standard ladder that will allow us to use some math to calculate a size curve. We can, then, get the exact size of our PCR product. All the different sizes, or alleles, at each locus are then used to construct a genotype for each individual. We, then, use more math to compare how similar genotypes are to one another. How do we set up a feeding assay? Alyssa in the field collecting seaweed. 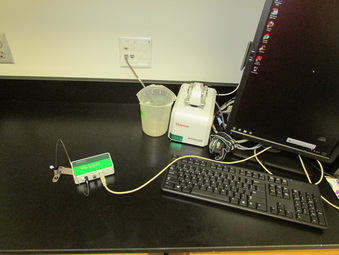 There are several steps that must be completed before the feeding assay experiment is ready to run. Samples of seaweed must be obtained. Scientists at the Sotka Lab go out in the field to collect as much Ulva as they can in order to have enough for their research. 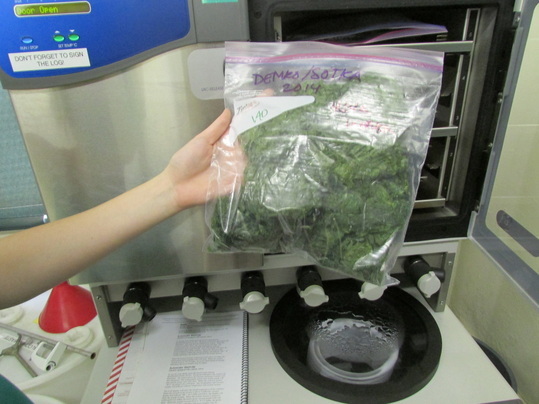 Samples of seaweed must go through the freeze-drying process using a lyophilizer for about 1-2 days. 3. 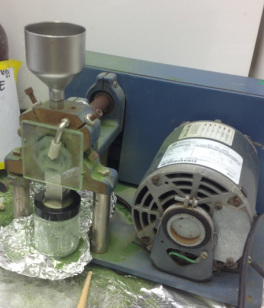 Seaweed samples must be ground down into a powder using an electric grinder. 4. Ground up seaweed is mixed with molten agar, to make a gelatin-like substance. 5. This gelatin mixture is poured on a window screen. 6. Window screen is cut up into known amounts. For example, 100 squares of window screen will be covered with the seaweed mixture. 7. Each seaweed covered window screen will be placed in a tank with organisms, such as crabs, urchins, and amphipods for a given amount of time. After that time has passed, the remaining seaweed on the window screen will be counted to see how much that animal ate! For example, if a window screen has 100 squares covered by seaweed and 50 squares are left covered after letting a animal eat for 24 hours, one animal ate 50 squares of seaweed! Polymerase Chain Reaction (PCR) is a scientific method that scientists at the Sotka Lab use during their research. PCR is a method for creating multiple copies of a specific piece of DNA in a test tube. It is used in the lab for identifying genetic fingerprints (individual genes), which can distinguish between individuals of the same species using only their DNA. Stacy has used this method to identify the difference between male and female Gracilaria seaweeds. What are the steps in PCR? ​What are the steps in PCR? What is done with the PCR product? The PCR product can be identified by its size using gel electrophoresis. This is a process that consists of injecting DNA into a gel and then applying an electric current to the gel. As a result, the smaller DNA strands move toward the positive current. Smaller strands of DNA move faster than larger strands of DNA through the gel. The result is an image of multiple bands. 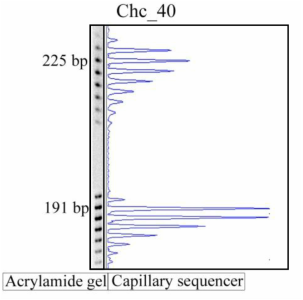 The size of the PCR product (individual gene) can be determined by comparing it with a DNA ladder, which contains DNA fragments of known size that are also within the gel. In order to determine an individual’s microsatellite genotype or its life history stage, we have to first extract it’s DNA. DNA, or deoxyribonucleic acid, is the molecule that encodes the genetic instructions used in development and functioning in living organisms. It is composed of four different types of nucleotides. The first is nuclear DNA from the nucleus of a eukaryotic cell that houses genetic information. We use certain markers found in this type of DNA in all the organisms we study, animals, plants and seaweeds. The second is the DNA from the chloroplast, a specialized organelle in algae and plants, where photosynthesis occurs. Learn more about chloroplasts and photosynthesis here! Finally, we work with mitochondrial DNA, which is found in the mitochondria, or the cellular powerhouses because they generate the cell’s energy in chemical form, in the animals, plants and seaweeds we study. First, we have to mechanically open up the cells by homogenizing the plant or animal material. Homogenize simply means to make uniform or make similar. For animals, we take preserved tissue that has been stored in ethanol. The ethanol fixes the tissue so the DNA does not degrade. The type of tissue depends on the organism. Figuring out which type of tissue requires a lot of trial and error. Researchers use tissue from hair to fin clips. For all seaweeds, including Gracilaria vermiculophylla, we dry the algal material with silica gel. This is what is called a desiccant and removes water from the algal pieces and dries them, preserving the DNA like ethanol does for animal tissue. What we use is very similar to the little packets found in new purses or sometimes in a new shoebox. Once the material is dried, we use our mixer mill to grind the material into a very fine powder. We then added what is called lysis buffer to the ground seaweed tissue or to the animal tissue. 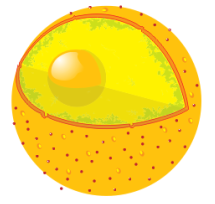 The lysis buffer causes the cells to open. For animals, we heat the tissue and lysis buffer mix to 65 degrees Celsius (that’s about 150 degrees Fahrenheit). But, during her PhD, Dr. Stacy and the lab, found room temperature worked better for seaweeds rather than heating the mix to 65 degrees Celsius. The resulting mix is called a lysate. But, it’s not just DNA, but other things, such as cellular debris (i.e., trash) or polysaccarhides (i.e., sugars). We remove the gunk by centrifuging. This step spins our tubes or plates really, really fast. This spinning forces all the gunk to the bottom of the tube. 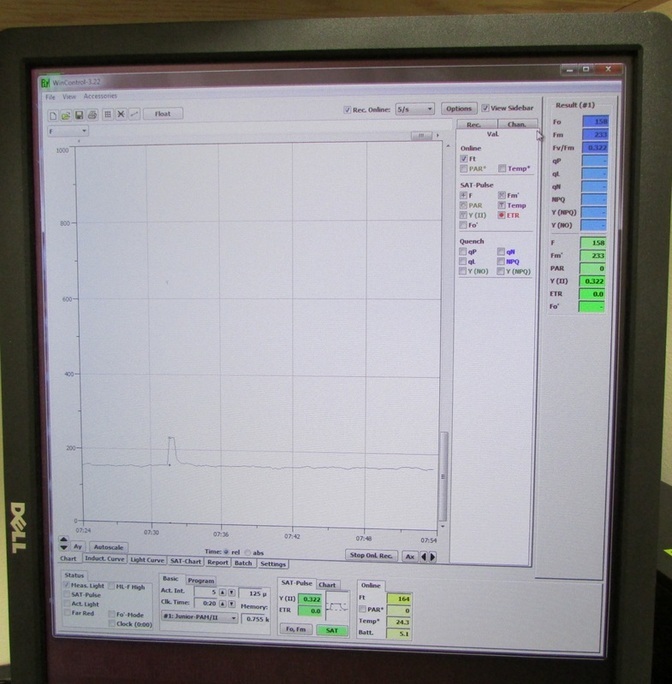 We, next, pipet the cleared lysate to a new tube or a new plate. The binding buffer creates conditions that are optimal to bind the DNA, which has been floating in the lysate mix, to a silica membrane. We pass the lysate and binding buffer through the silica membrane by centrifugation or by vacuum pressure (see Vacuum manifold page). This step pulls the excess lysate mix through the membrane into a waster container. The DNA, meanwhile, has become bound to the membrane. After the DNA is bound, we wash the DNA with two different types of buffers that are much like a detergent you wash your clothes with. Laundry detergent washes the dirt off your clothes. Our wash buffers, wash the remaining gunk off our DNA. Finally, we elute the DNA. Elution is a process of extracting the DNA off the silica membrane by washing with really pure water or with a buffer provided in the kit. The wash buffers and elution steps require the use of the centrifuge or the vacuum manifold. Then, we have our DNA ready to go! Fragment analysis is the technique we use to analyze our microsatellite loci (see Microsatellites). Loci are specific locations of a gene, DNA sequence, or position on a chromosome. We are interested in the changes in length of a specific micro satellite locus rather than the exact sequence (the order of nucleotides A, C, T or G). These differences in size can accumulate quickly in a population which allows us to detect patterns of paternity as well as differentiation between populations. ​We also want to know the exact sequence of some genes used to barcode individuals, like a barcode on a book you might buy at a bookstore! 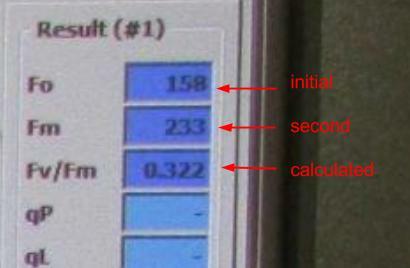 The capillary sequencer can’t see the DNA sequence. We incorporate fluorescently-dyed nucleotides into a sequence of interest. This happens in several steps. First, the DNA is copied many times. Second, we begin to incorporate a fluorescently dyed nucleotide which stops the copying of that piece. We end up with some pieces that end in a T, some in A, some in C and some in G.
We, then, pass the PCR products through the capillary sequencer and the laser in the sequencer causes the different dyes to fluoresce. A software program then reads the bases as the pieces pass by the laser and slowly a large basepair sequence is constructed. We then have to polish each sequence using another program. Sometimes, some basepairs are hard to read so we have to look at the raw data. In the end, we obtain a 500 or so basepair sequence. We, then, use another program to compare the order of nucleotides in one individual with another individual. We can then calculate the proportion of differences between the sequence of two or many individuals. The variation at single genes is much lower than at microsatellites as often these genes code for something important. Thus, they can’t vary too much otherwise the function they provide may not work. Stacy and Sarah were using a single gene in the mitochondrial genome of Gracilaria vermiculophylla to help trace the invasive history. They also applied restriction enzymes to this gene which meant they didn’t have to sequence and clean up over 2000 individual sequences!! Alyssa is using a nuclear single gene to help her construct her seaweed phylogeny of red and brown seaweeds from San Diego, Antarctica and Fiji!